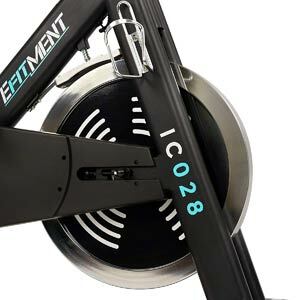 The IC028 is one of the new indoor cycling trainers released by Efitment in 2019. It’s similar in specs with the Efitment IC014 but has a heavier flywheel and a leather-pad as main resistance element which is more durable than a felt-pad. It’s a bike designed for home use, but does offer a pretty decent construction and overall durability. 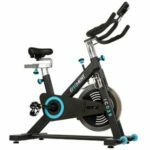 Like most other spin bikes in this feature range, the Efitment IC028 is not a large fitness machine; with the frame fully set up, it is approx. 51″ (129 cm) long, and 20″ (50 cm) wide. This being said, it shouldn’t require a usage area larger than 70″ x 60″ (177 x 152 cm). Also, due to the extra-heavy flywheel, it weighs approx. 123 lbs (55.7 kg) which is quite impressive for a home use exercise bike. Differently put, it is at least three times heavier than the average road bike, and all this weight is reflected in its overall stability. You can be sure that it won’t rock or move even if you engage in the most demanding spin workouts. Needless to say, the bike’s structural frame is made of heavy-duty, precision-welded steel tubing. It has a triangular design for improved sturdiness, combining rectangular and ovalized tubes in its construction. All the steel tubes of the main frame area coated with a corrosion-resistant powder finish with the exception of the seat and handlebar posts which are chrome-coated. The color used for the frame is black, with the “Efitment” logo and the number of the bike painted white/blue, these being the only colors available for this bike model. The bike’s bases are equipped with adjustable stabilizers. They have large rubber pads in order to provide a superior grip on the floor. Due to these pads, it is not necessary to place and use the bike on a rubber mat, but this recommended for any indoor cycling bike. The bike’s front base features large silicone wheels to facilitate the relocation of the unit once you have finished your workout. By using these wheels, you won’t be handling more than 30% of its total weight. Last but not least, the bike’s frame has a small short bar connecting the seat tube to the main oblique tube which can serve as step-up support. However, this element is covered by the belt guard which is made of ABS plastic. If stepping on it, the guard may crack, so this is not recommended. The Efitment IC028 includes a saddle made for superior comfort, similar to the one on the IC031 model. It has a thick layer of cushioning and a durable, double-stitched upholstery made of faux leather. It features a longitudinal groove in order to deliver superior breathability. It also has two shock absorption springs at the rear which improve its overall comfort. The attachment system of the saddle is classic, collar-based. This being said, in case by some reason you want to replace it, compatible options are widely available. The bike’s seat is 4-way adjustable (front, back, up, down). Its upright post has 8 adjustment positions providing increments of approx. 1″ (2.5 cm). This being said, the height of the seat can be adjusted for an inseam length between 29″ and 37.5″ (74 – 95 cm). Differently put, the bike can accommodate users between 5’0″ and 6’5″ (153 – 196 cm) allowing a complete leg extension. Plus, its horizontal slider offers several extra inches of front-back adjustment. The bike’s seat assembly is also durable enough to support users up to 275 lbs (125 kg). The IC028 is equipped with a 2-way adjustable handlebar. 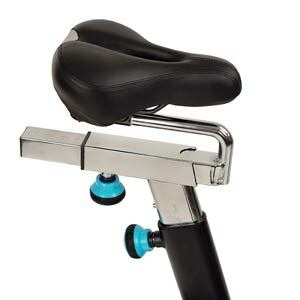 Its upright bar offers 6 adjustment positions with the same 1″ (2.5 cm) increments. The handlebar assembly features a multi-grip design. It has a loop aero bar in the center to which the exercise meter attaches. Also, its side grips integrate stainless steel pulse sensors. Therefore, if you hold on to them, the included bike computer can monitor your average heart rate. 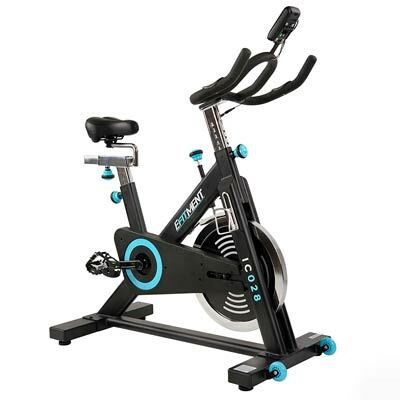 The Efitment IC028 is currently the Efitment exercise bike with the heaviest flywheel. It weighs 48.5 lbs (22 kg), a weight which is great for high-intensity spin workouts. It’s also perimeter-weighted in order to deliver a very aggressive inertia and a consistent momentum. The flywheel is bi-directional. This means you can pedal in reverse if you want. But as a general idea, when pedaling in reverse the resistance remains the same, given by how much friction the brake applies to the flywheel. 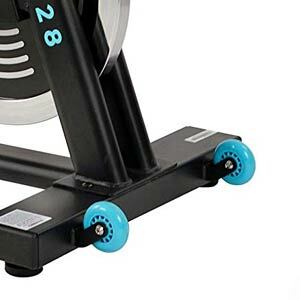 Also, you cannot coast on this exercise bike as you normally could on a road bike; the pedals continue to spin for as long as the flywheel is spinning. The bike’s crankset features heavy-duty steel arms and metallic pedals. This being said, it is durable enough to support any spin workout and any user up to the specified 275 lbs (125 kg) weight capacity. The pedals feature adjustable toe cages but do not have SPD clips for spin shoes. However, their threads are standard (9/16″) so compatible options are widely available. The bike’s drive system uses a durable v-belt for its internal transmission. A belt drive typically comes with three main advantages. First of all, you won’t need to ever lubricate it. Second of all, the pedaling motion is whisper-quiet. And third of all, it generates considerably less vibration than a chain. As we’ve mentioned above, the bike’s resistance system is friction-based. It uses a leather-pad which is considerably more durable than a felt-pad. This brake pad is attached to the tension knob on top of the frame and comes in contact with the flywheel from above. Therefore, the more you tighten the knob, the more drag the brake will generate, and the more pedaling difficulty you will benefit from. The bike’s resistance system does not have pre-determined settings like most magnetic bikes. You can simply tighten the brake up to the point you can barely pedal. Also, the tension knob can act as an emergency brake; you can press it down to immediately stop the flywheel and the pedals from spinning. 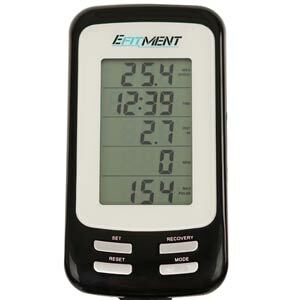 The Efitment IC028 includes the same fitness meter unit as the IC014 model. It features an LCD display with five sections. The top section shows Speed, Avg. Speed, and Max. Speed. The 2nd section shows time, the 3rd section indicates distance, the 4th section displays Calories and RPM, and the 5th window shows Pulse, Avg. Pulse, and Max. Pulse. The meter unit is fairly easy to operate. It has four buttons – Mode, Set, Reset, and Recovery. The Mode button allows you to select functions or the Scan functions to rotate Speed/Avg. Speed/Max. Speed, Calories/RPM, and Pulse/Avg. Pulse/Max. Pulse in their windows. The Set button allows you to set up countdown timers for distance, calories, and time. The Reset button clears all the values to zero. The Recovery button covers the unit’s Recovery function. This function is to be used at the end of your workout. When initiated, it measures the time it takes for your heart to return to a normal BPM, and based on that result it will give you a fitness rating between F1 (Excellent) and F6 (Poor). The fitness meter can only read your pulse via the sensors integrated into the handlebars. It is not telemetric, and therefore, it cannot communicate with a wireless HR chest strap transmitters. Also, the speed and distance metrics are only shown in imperial units (mph and miles). The meter unit requires 2 AAA (1.5 V) batteries which are included. It starts up when you begin pedaling or when you press the Mode button. It also has a sleep mode to which it will enter if it does not detect any input on the bike for 4 minutes. The bike’s main frame comes pre-assembled. The flywheel, the brake elements, the crankset, and the belt are already assembled as well. Therefore, you only need to attach the bike’s base tubes, the seat post, the handlebar post, the saddle, the handlebar, the console, and the pedals. This shouldn’t take more than 30-40 minutes. All the tools required for it are included with the bike. Plus, the manual provides very clear assembly instructions so you shouldn’t need professional assistance. Since the bike features a belt drive mechanism, its transmission does not require lubrication. Therefore, the only maintenance that is required is keeping the bike clean, and periodically check for loose parts. The Efitment IC028 is an indoor cycling bike designed for home use. It is equipped with an extra-heavy 48.5 lbs flywheel, leather-pad friction resistance, and a high-comfort cushioned seat. It has a durable steel frame rated for a user weight capacity of 275 lbs. It’s an excellent trainer for any spin workout, high-intensity cardio, muscle toning, stamina development, leg muscle strength development, and weight loss. In all, it’s a well-built indoor cycle, considerably more affordable than all commercial spin bikes, offering an excellent price/quality ratio.